Priscilla Lopes-Schliep (born 26 August 1982) is a retired Canadian hurdler in track and field athletic competition. She was born in Scarborough, Ontario and currently lives in Whitby. Born in Canada, her heritage is Guyanese and Portuguese. She is the first cousin of soccer player Dwayne De Rosario. Lopes-Schliep attended the University of Nebraska–Lincoln. She married former University of Nebraska basketball player, Bronsen Schliep, in the fall of 2007. They currently reside in Toronto, where he practices dentistry. In 2004 Priscilla became the 2004 NCAA Indoor Champion in the 60 meter hurdles with a time of 7.82 as her personal best. Lopes-Schliep won a bronze medal at the 2008 Summer Olympics in women's 100 m hurdles. It was the first medal for Canada in Athletics at the Summer Olympics since the 1996 Games and the first medal for a Canadian woman in Olympic track and field since the 1992 Games. 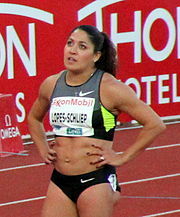 At the 2009 World Championships in Athletics, Lopes-Schliep won a silver medal in the 100 m hurdles in Berlin, Germany, in a time of 12.54s. She failed to qualify for the 2012 London Olympics, having finished 7th in the 100m hurdles at the 2012 Canadian Olympic trials for track and field after she struck a hurdle and fell. Lopes-Schliep has the LMNA R482W gene mutation, and was diagnosed with Dunnigan-type Lipodystrophy. The diagnosis came from research conducted by Jill Viles, a muscular dystrophy patient, who spotted physical similarities between herself and Lopes-Schliep and encouraged her to undergo genetic testing. The results confirmed Dunnigan-type Lipodystrophy, and alerted Lopes-Schliep to a potential pancreatitis attack due to the high levels of fat in her blood, though this was avoided by modifying her diet. ^ "Priscilla Lopes-Schliep: the underdog who overcame the odds". SPIKES magazine. Archived from the original on 12 March 2010. Retrieved 30 August 2010. ^ Zeisberger, Mike (20 August 2008). "De Rosario gets lifted". Slam! Sports. Sun Media. Retrieved 19 August 2009. ^ USA Track & Field (11 January 2011). "Young stars Rupp, Harrison to be showcased at Millrose Games". USA Track & Field. Retrieved 24 November 2013. ^ The Canadian Press (19 August 2008). "Lopes-Schliep wins bronze in women's 100M hurdles". TSN.ca. Retrieved 19 August 2008. ^ "Lopes-Schliep takes silver in 100m hurdle". CTV Olympics. 19 August 2009. Retrieved 19 August 2009. ^ "IAAF 2009 World Championships Official Results". Archived from the original on 15 August 2012. Retrieved 29 August 2009. ^ Dave Feschuk (30 June 2012). "London 2012: Zelinka wins, Felicien and Lopes-Schliep fail to qualify at Olympic trials". Toronto Star. Retrieved 1 July 2012. ^ Vantyghem, MC; Pigny, P; Maurage, CA; Rouaix-Emery, N; Stojkovic, T; Cuisset, JM; Millaire, A; Lascols, O; Vermersch, P; Wemeau, JL; Capeau, J; Vigouroux, C. "Patients with familial partial lipodystrophy of the Dunnigan type due to a LMNA R482W mutation show muscular and cardiac abnormalities". J Clin Endocrinol Metab. 89: 5337–46. doi:10.1210/jc.2003-031658. PMID 15531479. ^ "The DIY Scientist, the Olympian, and the Mutated Gene". www.propublica.org. Retrieved 19 January 2016.